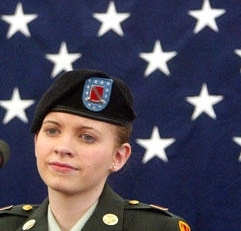 It is well-understood that the tale of Jessica Lynch’s battlefield heroics in Iraq in 2003 was bogus. Much less well-understood is how the story of her purported derring-do entered the public domain. Many accounts of the exaggerated hero-warrior tale blame the U.S. government or the U.S. military — or simply the U.S. — for cynically attempting to turn Lynch, then-19-year-old Army supply clerk, into a wartime hero. Far fewer accounts identify the real source of error — a botched report published 11 years ago today in the Washington Post. Most recently to err in describing the derivation of the Lynch saga is London’s Financial Times, a sophisticated newspaper printed on distinctive salmon-colored newsprint. How so, “the US”? The commentary doesn’t say. In the case of Pat Tillman, an Army Ranger and former professional football player, the U.S. Army’s Special Operations Command said that he had been killed by enemy gunfire in 2004, in Afghanistan. A subsequent Defense Department investigation determined his death was caused by friendly fire. But in the Lynch case, it was the Washington Post — not “the US,” and certainly not the U.S. military — that was the source of the bogus report. 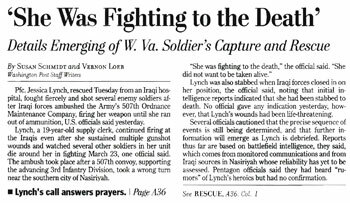 In a front-page article published April 3, 2003, the Post claimed that Lynch had “fought fiercely” in the ambush of her unit in Nasiriyah, in southern Iraq, that she had “shot several enemy soldiers” and continued firing her weapon “until she ran out of ammunition” and was captured. The Post declared that Lynch suffered “multiple gunshot wounds and watched several other soldiers in her unit die around her” in fighting in which 11 U.S. soldiers were killed. The Post cited otherwise unidentified “U.S. officials” as sources for the electrifying account of the young woman’s heroism. As it turned out, the hero-warrior tale — written by Susan Schmidt and Vernon Loeb — was wrong in almost every major respect. The ambush did occur, on March 23, 2003, in the first days of the Iraq War. But Lynch did not fire her weapon in the attack. Nor was she shot and stabbed, as the Post reported. Lynch was badly injured in the crash of her Humvee as it tried to flee the escape. She was taken to an Iraqi hospital where she lingered near death until rescued by U.S. special forces on April 1, 2003. Over the years, though, the role of the Post in propelling Lynch into unwarranted international fame has receded in favor of a false narrative that the Pentagon made it all up. What accounts for this transformation? Why has the Post’s singular role in the Lynch case been so thoroughly eclipsed? One reason is that it’s perversely delicious and sinister to assert that the U.S. military concocted the hero-warrior tale about Lynch and somehow fed it to gullible news outlets. That’s a far more engaging story than that of mangled newspaper reporting. Another reason is that the Post, on occasion, has been complicit in muddying its decisive contribution to Lynch fable. The newspaper has been known to characterize the hero-warrior tale as one that other news media were telling, too. That’s true, but only after the Post published the story that made Lynch, quite undeservedly, the best-known Army private of the Iraq War. Eleven years on, the Post has never adequately explained how it so thoroughly botched its report about Lynch.